Installing insulation in the home will raise energy efficiency, lowering energy bills. It will suppress noise and increase privacy if installed in interior walls. There are many benefits to installing insulation in a home. The thermal benefit is the primary one; insulation repels heat in the summertime and keeps the cold at bay during the winter. Where is it most effective? First, attic insulation because this is where the sun has the greatest impact, and secondly inside the exterior walls. It is only logical to install wall insulation as one of the ways to save energy and money but its best done during initial residential construction. Proper insulation also saves on energy costs and reduces utility bills by keeping the home heating system efficient. Another benefit of insulation is noise suppression. Sound waves penetrate a wall, travel through the interior of the wall, and then pass through the opposing side. This compromises privacy and disturbs others. If insulation is added, it will absorb much of the sound. Interior walls are where insulation is used for this purpose. Insulation is cheap when compared to the money it will save. And installing insulation is an easy project. The most common insulation in residential applications is composed of spun fiberglass. It usually comes with paper on one side but can be purchased without the paper. Why the paper? When placed between wall studs, the paper that extends past the sides is stapled to the wood studs. This way the insulation keeps its position and wont sag over the course of time, which reduces its benefits. The paper also reduces the installers contact with fiberglass fibers. For most applications, insulation in roll form is better than fixed-length bats. Long ago, asbestos was used for many insulating applications. Not so anymore; in fact it has created a new industry: asbestos abatement. This is a concern when removing popcorn ceilings. Other materials you might encounter are various types of reflective insulation (radiant barrier products kind of fall in this category), blown cellulose, Styrofoam, rockwool (really nasty), polyurethane, and mineral wool. Dont want to do the work yourself? Find local reviews on the services you need at Angie’s List – from electricians to physicians – Take the Tour! If at all possible, exterior wall insulation should be installed during the construction phase, before any sheetrock has been installed on the inside of the exterior walls (but the exterior should be dried in). For interior walls, install it before any sheetrock has been hung or after one side has been hung. In any case, wait until after all plumbing and electrical work in the wall cavity has been completed. Installation is a breeze; begin anywhere that's convenient. Place the insulation between the studs with the paper side towards you, the insulation installer. Start stapling the paper to the studs beginning at the top and work down. At the bottom simply cut off the roll. Plumbing and electrical outlets will necessitate working with chunks of insulation. In an attic there won't be much stapling due to the fact that most surfaces are horizontal. Just roll the insulation out over the rafters and cut it off. Leave the exposed fiberglass side facing up and the paper down. Begin close to the roof's edge and work inward. How much do you need? 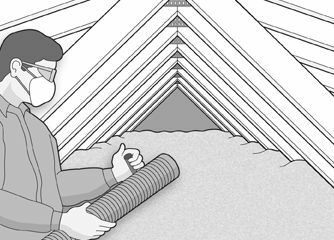 According to the U.S. government's Energy Star attic insulation recommendation, you should have 10 to 14 inches, bringing you to R-38. Once all the insulation has been installed, the savings can begin! © 2008 Kelly Smith all rights reserved; content may not be copied, rewritten, or republished without authors written permission.